1,000 Lilies aka Susinon ~ "Susinon was a luxurious and strongly scented lily perfume that was made by the Egyptians as well as the Greeks, but the Egyptian version was thought to “excel most’. This fabulous fragrance was also used by Cleopatra to scent the sails of her royal barge, perfuming the air along the Nile as she sailed, proclaiming herself as Goddess and Queen." With notes of cardamom, cinnamon, fragrant wine accord, galbanum, Kenya lily, narcissus, orris, pink lotus, saffron, Turkish rose, ylang ylang, sandalwood, honey, myrrh and sweet flag. Antiu aka Metopion ~ "Antiu is the name we chose for our modern adaptation of “Metopion”, a famous Egyptian perfume that had been known some 300 years before Pliny the Elder and Dioscorides mentioned it." Featuring bitter almond, cardamom, fragrant wine accord, galbanum, lemongrass, sandalwood, rose otto, honey beeswax, copaiba balsam, mastic, myrrh, Peru balsam, pine and sweet flag. Keni aka The Medesian / The Egyptian ~ "Keni (which means embrace) is the name we chose for our modern adaptation of “the Medesian”. The Mendesian as well as a similar and equally famous perfume, simply called “The Egyptian” was based on the three most prevalent aromatics found in ancient Egyptian perfumes: Cardamom, Cinnamon and Myrrh. The Medesian was so called as it was produced in Mendes, the royal city in ‘early times’ and later produced in the neighboring town of Thimus. It proved to be so widely used in Egypt and throughout the ancient world that eventually it’s production was appropriated by the Phoenicians. Especially popular during Ptolomeic period, it is said that Cleopatra scented her feet with the Mendesian." The notes include bitter almond, cardamom, cassia, cinnamon, sandalwood, benzoin, fragrant wine accord, Atlas cedar, myrrh and pine. Megaleion ~ "Perhaps the world’s first “designer fragrance”... Although the origin of this scent is not entirely clear, it is said to be named for the inventor, one ‘Megalus’. It could also be named for the place, Megale near Syracuse, where it was allegedly prepared or simply to reflect the degree of it’s importance as megalos means ‘great’. By the time of Pliny the Elder, Megaleion had achieved a kind of celebrity due to it’s extreme cost, complexity of ingredients and the painstaking method of it’s production." The notes feature cardamom, cassia, cinnamon, fragrant wine accord, lemongrass, sandalwood, balm of Gilead accord, spikenard, Turkish rose, copaiba balsam, costus, myrrh, frankincense, Peru balsam, pine and sweet flag. Those bottles are beautiful, although the phrase “Mummy presentation bottles” makes me giggle. I think Susinon is really beautiful. It is an odd wording, but those bottles are wonderful. Now see *that* is how you spend $250! Eh. I don’t care so much about bottles. Has anyone here experienced the two fragrances that have previously been available – the Arome Egypte and Cardamom & Kyphi? They all sound great to me, but then I love cardamon. Also love those bottles. I haven’t gotten around to sampling from this line yet. What should I look at? I have tried (and liked) Cardamom & Kyphi, but not the other. Need to retry the other. Thanks for this Robin. I’ve spent hours earlier this month filling the online shopping cart at the DSH website full of samples to try of fragrances that seemed intriguing. Then looked to find I had a shopping cart totaling $140. Samples add up. Then I tried to whittle down. Then I just gave up. So now this is more to add to the filling and unfiling of the cart. Since we’ve brought up DSH, I’d love to hear from people their favorite DSH scents. In general, I’m not a floral or gourmand girl–any recommendations? No FLORALS?? Sigh. Here I was all ready to recommend Rose Vert and Oeillets Rouges. Okay, a few nonflorals I’ve really enjoyed from DSH would be Festive (a resinous, piney-amber thing), and The Silk Road (tea, spices, leather, a few non-girly florals like deep rose and osmanthus). My fav floral of hers that I have tried is the Giardini Segreti, which is just super beautiful floral with a tendency toward a very soft and powdery tuberose. And I don’t really like prominent tuberose, so you can see why I like it so much. Super pretty stuff. I got a pack of samples to work thru from DSH too…try Fire Opal and Blue-Green; they didn’t seen floral. I really liked Fire Opal! I think I’ve reviewed all the ones I really liked…although I have only tried a fraction of the line. For me, one of her most incredible non-flora gourmand fragrances is Majoun. Soooo yummy! Oops, I see now you don’t like gourmands either…. Well, this one’s different, so give it a whirl! Thanks everyone. Will go start refilling online basket! I feel like I should clarify–when i say things like no florals, people have heart attacks. I’m not against floral notes, but can almost never pull off a true floral. Gardenia, tuberose, carnation, lily of the valley, …wait, when I start listing like this it sounds worse, but in general if it’s overwhelmingly floral, it’s not me. It works better on others. Hey, you like what you like, no stress. I was just disappointed to not get to share my fave DSH scents (which are, guess what, florals). A lot of “unisex” stuff I find too masculine for me and my taste is definitively girly. I’m me, you’re you, no prob. I have a sample of 1000 Lilies on my desk awaiting test – but I see now that I should have added a sample of Keni to my recent order! Spices and myrrh? Ooh, must try. Mals! Review! Pronto! Can’t you tell I am dying over here!!! Tested her Parfum de Grasse this morning: it’s reading “musty” and “really old-fashioned” to me – as if it were some indistinctly-labeled random 1950s scent I bought for peanuts on ebay. Which is really, really unusual for DSH, and particularly for something with a high percentage of natural ingredients. Maybe it’s my freaky nose, I dunno. Lots of neroli and carnation in there (I love carnation), and I’m picking up the beeswax and liking that too. I don’t know what it is, but it’s the same note that just killlllled me in Hiris and in Bvlgari Pour Femme. All the Bulgari’s have this base musk that just slay my nose and give me a huge headache. I like the way they open, but once we start into the middle and drydown, I can’t scrub fast enough. It is unusual as that rarely happens to me, but it is just particular to their line. Well, you will just have to review 1000 lilies on your site! Oh, it’s beautiful! Will def. review for blog, probably next week. I am still crazy with canning tomatoes and freezing corn. And the peaches just came in, too. I’m a really big fan of DSH’s scents. The Vert and Prana are lovely non floral/gourmand scents to try. Cardamon & Kyphi is wonderful for cooler weather. Can’t wait for this heat to pass to wear it! I had the opportunity to meet Dawn on my last trip to Boulder, CO – she is so very sweet, warm, inviting, quite funny and very intelligent. After 2 visits to the Essence Studio, I walked out with only 5 (it could have been a lot more…..): Vanille, Menthe Moderne, Special Formula Xtreme, Quinacridone Violet, and Sienna (which I’m wearing now). All of the fragrances are wonderful!!!! Ok – it’s finally happened: I have total and complete bottle lust. Once upon a time, I wanted to be an archaeologist. Sigh. I love ancient world stuff. I like a bunch of DSH fragrances. But I those bottles are amazing!!! Now I have to go back and read the frag notes to see if one of them is appealing to me, lol. Oh My God. They all read like they will smell amazing. I especially like the Metopion. Aaggh.. Wow. I am truly impressed which doesn’t happen often. Oh I *must* try these… I read a bit about them a couple weeks ago and was intrigued, but I wasn’t sure samples were available. Now that I know they ar, I’m going to have to place an order. This entire line sounds amazing, and I’ve been meaning to place a DSH sample order forever. I entered a little contest on Dawn’s blog and won a sampler set of theses. She zoomed it out to me and I received it in just a couple of days! The other fragrances were rich and incensey, and of course I lurrrrrve Cardamom & Khyphi, but it’s this first one that really knocked me for a loop. Perfume and Egypt?? Swoon… These sound gorgeous! I love all things Egyptian and in fact wanted to be an Egyptologist at one stage so these are right up my alley. And the bottles are seriously tempting- if the pound could strengthen against the dollar then I could just about justify one as an early birthday gift to myself. But what should it be filled with… Choices, choices! This summer I was volunteering at the Rosicrucian Egyptian Museum in San Jose. They have the wrapped mummy of a little girl from the Roman period there, and in addition to their big project to do sophisticated scans of the mummy, they also analyzed (verrry accurately, using mass spectrometry, etc) the perfumed oil that was poured on at the time of burial. It turned out to be frankincense, myrrh, and moringa oil, and they actually recreated it. 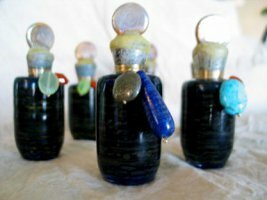 The cost of making it was prohibitive, so they only have a few tiny bottles, but they do bring those out at the Egyptian Perfumery workshops that they occasionally put on, or sometimes for tour groups. Sadly, I kept forgetting to ask them to take it out so I could smell it! Now this is super exciting to me. I’m all over it. I’m totally coveting one, but I just don’t have the $$ unfortunately. A pity. Arome d’Egypte was a no-no, but I am a huge fan of Nourouz (the perfume formerly known as Tamarind Paprika!) and Cimabue. And a few others besides. Would certainly be curious to try these, especially Khypi. I want these for the bottles alone. I’m a bit of an armchair Egyptologist — it was my dream career when I was a teenager & had aspirations of attending the University of Turin. Despite the fact that I never quite made it to Turin and ultimately studied an even more niche area of history, I still love anything Egyptian. Incense-y perfumes as also perhaps my favourite. I really honestly can’t find a good reason not to spend $275 on this. Lusting right now. I need one of those bottles NOW! So, I guess I’ll get to ordering some samples and figure out which one I’m going to get. I really do not want to spend $275, but I also do not have a problem doing it.